I've been having cystic acne breakouts for years and I've tried everything OTC and prescription, including Accutane, and nothing worked. 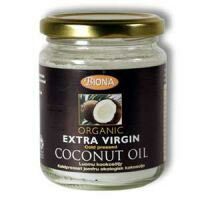 The virgin coconut oil was the only thing that resolved my cystic acne. I only tried it because I saw it on Pintrest and I thought I had nothing to lose. So I went to Target and bought the organic virgin coconut oil, and the second I put it on my face I knew I made the right decision. My skin felt instantly better and I haven't had a cystic node since. I occasionally get one or two white heads but they're gone in 2 days and very easily manageable. I think I was just over drying my face which lead to my acne. This is my routine: Wake up and wash my face with warm water. Then I tone with a 1:1 ration of water and apple cider vinegar and let it dry. Next, I oil up my face with coconut oil and I'm done. Super fast and easy, plus it feels great and I smell coconut all day. What brand did you get? And is it unrefined or refined? Thanks!